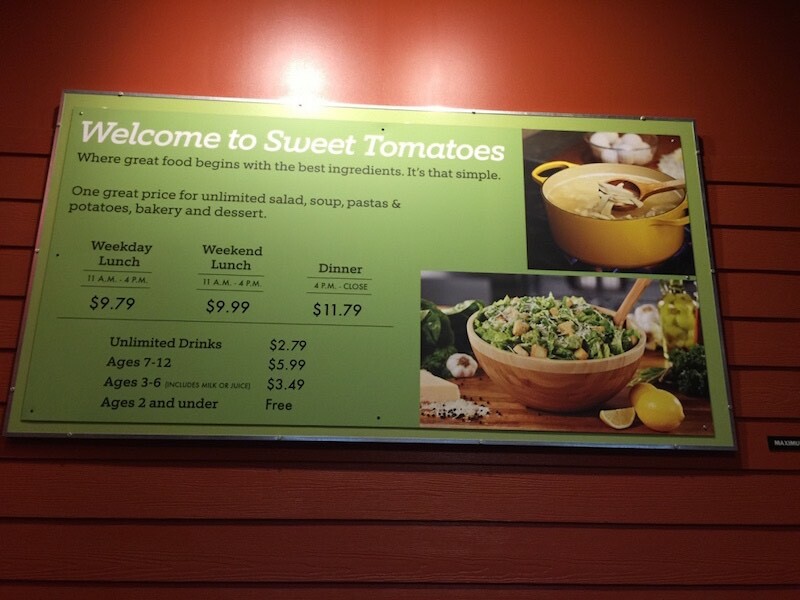 One of our favourite places to eat when we are in the USA is Sweet Tomatoes, also known in some states as Souplantation. We have found Sweet Tomatoes in both California and Florida, and often its our “go to” restaurant of choice as vegetarians. We have rarely been impressed by vegetarian offerings in other restaurants we have tried. Veggie burgers and chips for lunch and dinner for a 3 or 4 week holiday is more than this veggie lover can stand. 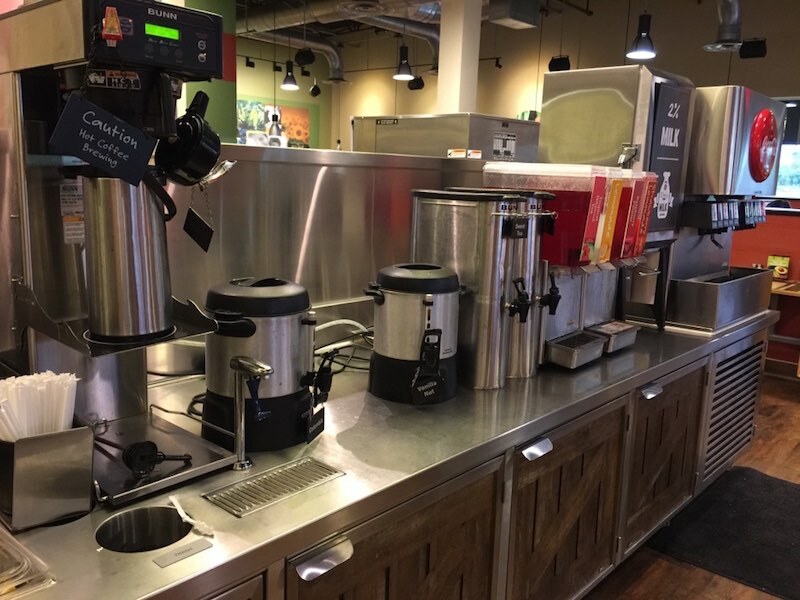 Sweet Tomatoes has a huge salad bar and their specialty items change about every two weeks but some familiar staples always appear. But I’m getting ahead of myself. First up, pricing, at this particularly location on Highway 192 in Kissimmee, just near Walt Disney World – adults are $11.79 for dinner. Drinks are extra but a cup for water is free. Children’s pricing is based on age – under 2 is free, 3-6 is $3.49 and 7-12 is $5.99. Remember these prices don’t include the 7% sales tax They also do a senior special from 2-5pm. 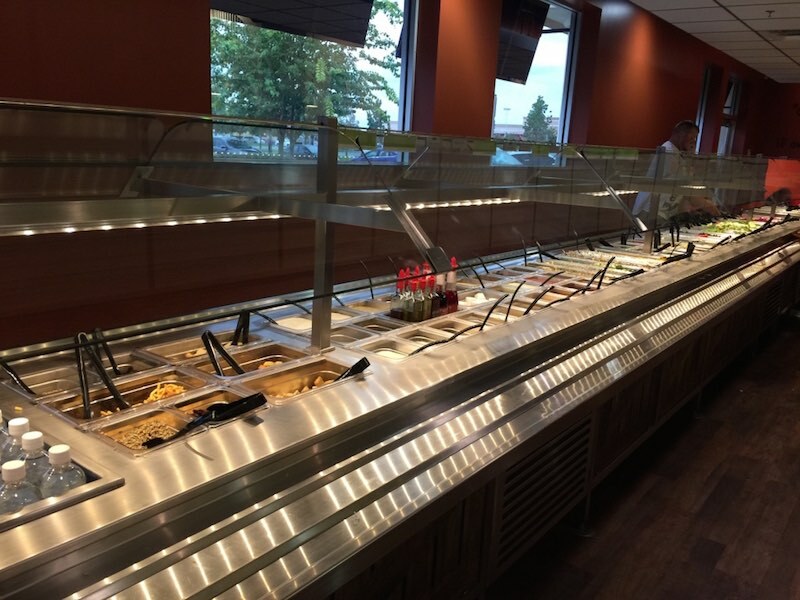 First up is the salad bar, you pick up a tray and plate and pile it high with all manner of mostly vegetarian items. Some of the specialty salads do contain meat or fish but these items are noted on the tags above the food. You name a vegetable and likely it’s there on the salad buffet for you to choose, along with cheese, seeds, croutons and bacon bits. There is also a huge array of salad dressings which you can put directly onto your salad or pick a couple and put into little cups to try later. Once you have piled up your plate you get to the cashier where you decide on a drink and pay. Now find a table. On rare occasions, in some restaurants, you may need to wait to be seated. We haven’t hit this at this location yet, but we have tended to dine here early. Then onto the hot food selections. First up is the soups. Some, if not all, of these change regularly. Again if you are vegetarian or gluten-free, check the signs. Vegans may need to check with staff on these for dairy products. 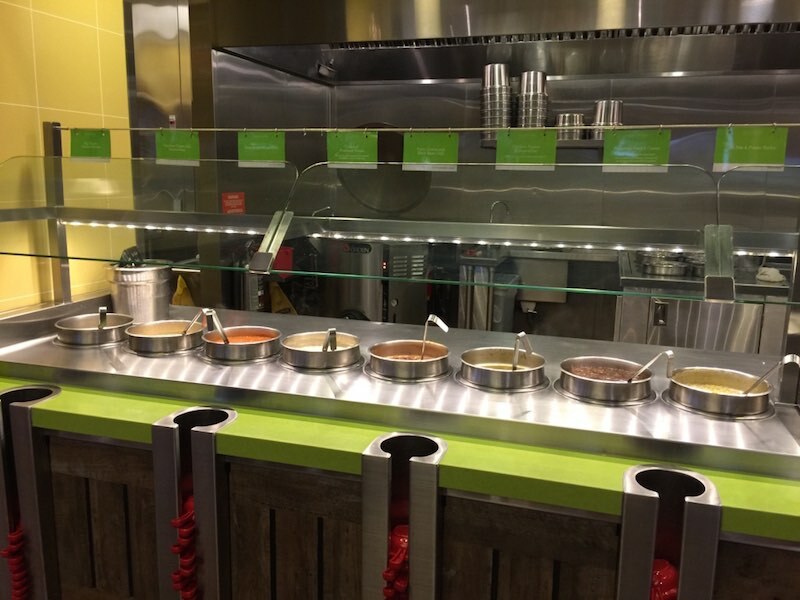 The first time we visited this location, 3 of the 8 soups were vegetarian. The second time, only two were. Consensus from those at our table that tried the soups, was that they were all wonderful. Just to the side of the soups are baked potatoes – both sweet and regular. The baked potatoes are worth skipping dessert for IMO. They are just so good! This is also where you will find items that you can top your soup or potato with – cheese, sour cream, bacon bits and spring onions etc. I have also topped my potato in the past with the “vegetarian chilli soup”. Further along from the potatoes, is the pasta and pizza station. 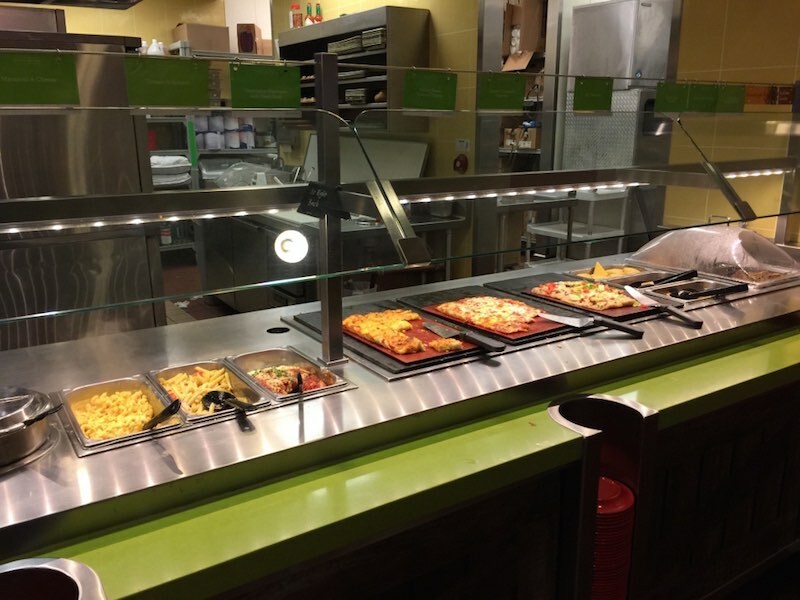 When we visited, the 3 pasta dishes were all vegetarian – macaroni cheese (but not a good one, just that awful fake orange one), penne with spinach, tomatoes and parmesan and a penne in marinara sauce. Pizzas and flat breads were a mix of vegetarian and something with meat. Some of these are also suitable for dipping into soup. A small handful of breads were also available here for going with your salad or soup. 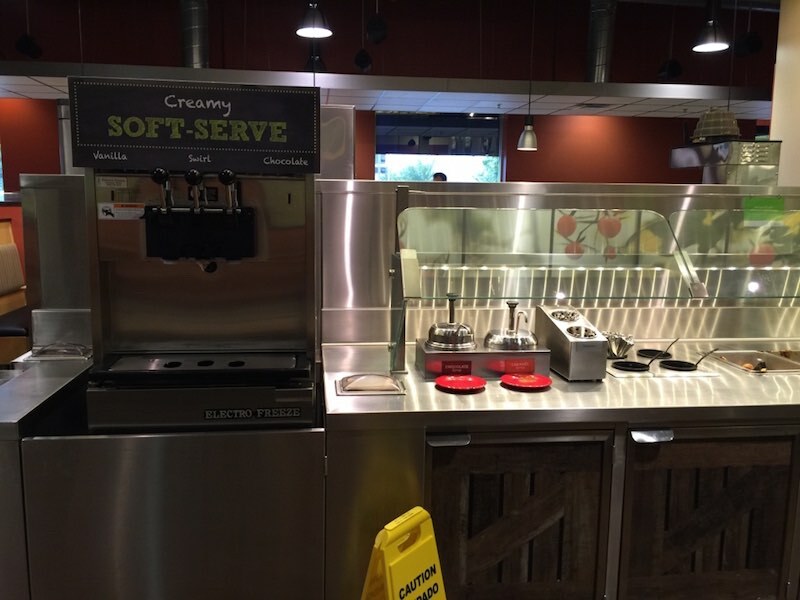 And the kids favourite section – the soft-serve ice-cream machine – vanilla, swirl and chocolate. Chocolate and caramel sauce plus sprinkles, crumbled Oreo cookies and so on. 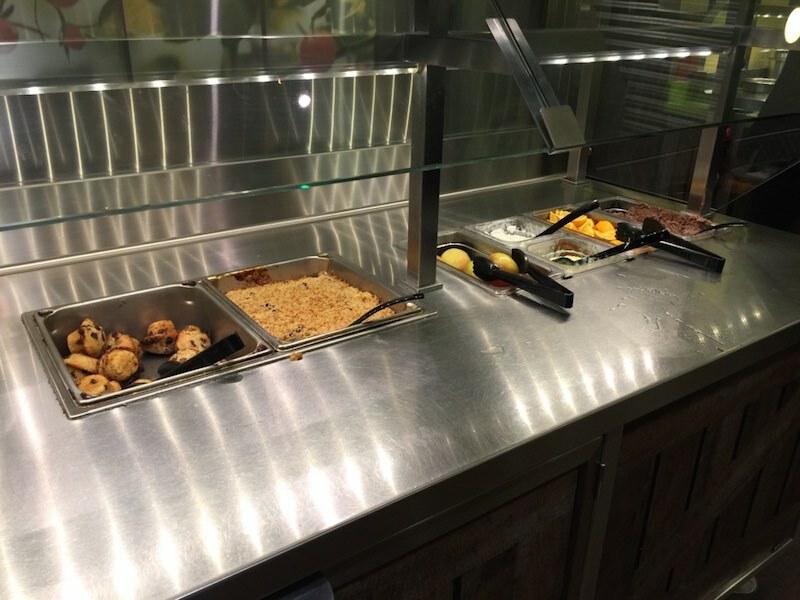 While the kids weren’t impressed with the buffet itself, this section rated 10/10. Just in case soft-serve isn’t your thing, on the day we visited, there were also chocolate chip muffins and a hot dessert of apple and blueberry crumble. There is also a handful of other items, whole apples, orange segments, cottage cheese, tapioca pudding and no-sugar added chocolate mousse. If you are getting a drink with your meal, there is tea, coffee, milk, soft drinks and maybe iced tea (or juice?). Can’t say I took too much notice, I was hydrating with my free water. So if you are vegetarian or gluten-free visiting the USA, I highly recommend Sweet Tomatoes. Make sure you check your receipt too, we got a 15% off coupon for completing a survey, thats not to be sniffed at. Too much vegetarian stuff for me! I would prefer Denny’s! We are vegetarian, Denny’s offers very little for us.